Life has grown more serene for the public relations people at Biosphere 2, the 3.15-acre sealed environment in the Arizona desert that once housed eight inhabitants for two years. Columbia's Lamont-Doherty Earth Observatory has taken over management of the scientific and educational aspects of its operation, replacing the former managers, accused of undermining the project's scientific integrity and of running a New Age cult. This move, coupled with the decision to stop sealing human crews inside, has rendered press coverage far less splashy. "Bad news is always exciting," says Lynn Ratener, formerly public affairs officer for Bio2. "From a public affairs point of view, nowadays it's a bit of a hard sell." It was not always so difficult to attract media attention. Back in the early days there were articles galore lauding the farsightedness of the project. There was the occasional potshot, such as the 1990 Business Week article, which looked askance at the visionary stance of the man funding the project, Fort Worth multimillionaire Ed Bass. But most early coverage was more akin to the May 1987 Discover magazine article, which called Bio2's attempt to develop a self-sustaining environment--as a potential prelude, in the views of some participants, to colonization of Mars--"the most exciting scientific project to be undertaken in the U.S. since President Kennedy launched us toward the moon." Later, Phil Donahue, in a live on-site broadcast, would call Bio2 "one of the most ambitious man-made projects ever." Such fawning hype, however, would prove to be a liability for the project by attracting the cynics in the journalistic community. The most damaging attack was launched by Marc Cooper, a writer for the irreverent Village Voice. Cooper's scathing 1991 article, "Take This Terrarium and Shove It," became the gold standard of Bio2 bashing. According to Cooper, "[T]he group that built, conceived, and directs the Biosphere project is not a group of high-tech researchers on the cutting edge of science but a clique of recycled theater performers that evolved out of an authoritarian--and decidedly non-scientific--personality cult. In short, the Biospherians may be talking science, but what they are doing is more akin to well-financed science fiction." Other journalists soon picked up on Cooper's allegations of mismanagement, duplicity, fudging of science, and cultish activities, parroting his charges in their own articles and broadcasts. Many of these allegations were at least partially true: carbon dioxide scrubbers were secretly installed, supplies were smuggled in, and the management and crew were indeed long-time members of a decidedly non-mainstream group. In addition, former managers John Allen and Margaret Augustine took a defensive line, claiming that nothing was amiss when the project was clearly not living up to its claims of self-sufficiency. The hermetically sealed dome of Bio2 provided little shelter from the ensuing torrent of bad press. Typical was a 1992 headline in the Washington Post, which called Bio2 a "Bogus New World" and labeled the project "science theater." Why did the press suddenly turn so viciously upon a project that it had once literally praised to the moon? The Economist provided an apt explanation in 1992: "The American media are now pelting Biosphere Two hard, perhaps because they are embarrassed by the uncritical praise they heaped on the project at first, praise which ignored the peculiar background of the project's organisers." Once locked into negative mode, the press coverage would not turn around until substantive changes were made. In particular, the former management, set more on colonizing Mars than on conducting serious scientific inquiry, was discharged, with Lamont-Doherty scientists eventually brought in as overseers. Today, the project has weathered the storms of its youth, entering a "respectable middle age," says Ratener. For instance, The Dallas Morning News heralded last November's Columbia takeover with the headline: "Whole New World: Biosphere 2's new managers say human isolation is out, pursuit of scientific credibility is in at huge desert project." 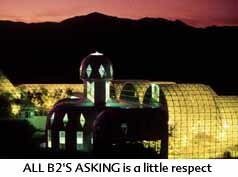 As further evidence of a grudging but growing respect in the media and the scientific community, Bass' publicist Terrell Lamb cites an August 1995 article in Scientific American--which had never before deigned to cover the project-entitled "Down to Earth: Biosphere 2 tries to get real." This article marks a turning point in Bio2's press treatment by critically examining the project's scientific merits, not the personalities involved. The overwhelming volume of media coverage--both positive and negative--has certainly made Bio2 one of the best-known scientific endeavors in America, says Lamb. After all, what other laboratory would attract coverage in more than 150 newspapers and on 56 television stations, as Bio2 did in mid-November, simply to report a change of management? With time and the guidance of qualified scientists, it's likely that Biosphere 2 may yet become not just famous but widely respected. SCOTT VEGGEBERG is a frequent contributor to New Scientist (London), The Scientist, and other publications. His electronic address is 72124.2314@compuserve.com.